Here’s a link to some of the special programming offered by Poets.org. *Write a poem a day for a month! *Visit the American Writers Museum in Chicago! *Check out the Pulitzer Prize winning poetry titles from 1918-present. Check our catalog to see what we have in our collection. *30 Ways to Celebrate National Poetry Month. Explore different types of poetry in the ECC Library. If you want to browse, poetry is generally found in the 811 section of the collection, although individual collections of poetry can be found in 808.81. You can also search our catalog for your favorite author. Here are some nearby poetry events, from Poets.org. Write a poem a day for a month! Visit the American Writers Museum in Chicago! 30 Ways to Celebrate National Poetry Month. Did you know that April is National Poetry Month? Now in its 21st year, National Poetry Month was established by the Academy of American Poets to celebrate poetry and its vital place in American culture. Click here for a Subject Search on Poetry in the library’s catalog. You can also narrow down to different types of poetry such as children’s, feminist, haiku, or love. Want to explore more options? Head on over to the About the Celebration site for more ways to participate. Which poets are your favorites? Leave us a comment! Want a suggestion? Ask your librarians! Did you know that April is National Poetry Month? Now in its 20th year, National Poetry Month was established by the Academy of American Poets to celebrate poetry and its vital place in American culture. And sweet’s the air of curly smoke from all my burning bridges. For open your mouth, lad! For every voice counts! Like men we’ll face the murderous, cowardly pack, Pressed to the wall, dying, but–fighting back! The accumulation of clothes and ashes circles you, rising like a moat after rainfall. Yet if we are bold, love strikes away the chains of fear from our souls. And there the moon-bird rests from his flight To cool in the peppermint wind. Who are your favorite poets? Leave us a comment! Did you know that April is National Poetry Month? Now in its 18th year, National Poetry Month was established by the Academy of American Poets to celebrate poetry and its vital place in American culture. Which poets are your favorites? Leave us a comment! 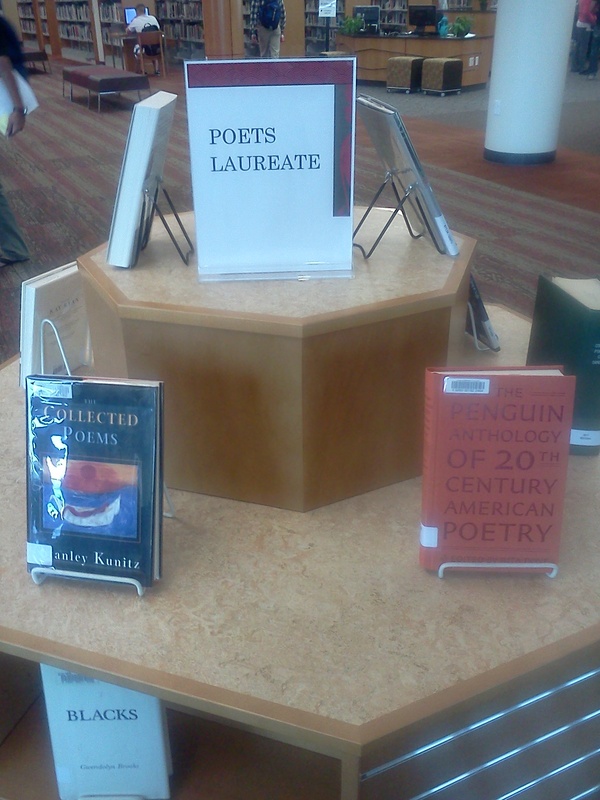 Browse the ECC Library displays on both the first and second floors in honor of National Poetry Month. On the first floor, we have featured audio-visual works on poets. On the second floor, we have a variety of print poetry, focusing primarily on new items to the collection. One of my favorite poets is Dorothy Parker; let us know in the comments which poems or poets you love best! Did you know that April is National Poetry Month? Celebrated since 1996, the Academy of American Poets established National Poetry Month to celebrate poetry and its vital place in American culture. In recognition of National Poetry Month, the Renner Academic Library has put together a display of poetry books written by Poets Laureate. The display is located on the Library’s second floor & all these books are available to check-out. Come to the Library and read some great poetry!